We'd like to congratulate BC8 and its investors on a successful IPO which was heavily oversubscribed and saw its share price up 50% from its listing price of 20c to close at 30c on its first day of trading yesterday. We've provided a summary of the key points on the company below. If you'd like to discuss further, please contact your investment adviser on 08 9263 5200. Overall strategy: Leveraging the Board and management’s extensive experience of exploring and bringing gold assets into production, BC8 aim to define existing known mineralisation and undertake extensional exploration activities at the Bulong Gold Project with a view to exploitation via a stand-alone plant located on site. An initial JORC Exploration Target has been estimated at 293,000 to 450,000 ounces. Bulong – one of the Goldfields highest grade producers: The Bulong Project was one of the highest-grade gold occurrences in the region, but its history is one of unconsolidated ownership with small scale production from a number of high grade mines. Records show historic mine production of ~152koz @ >1oz per tonne plus alluvial nugget gold recoveries. BC8 control 100% of 82 km2 of tenements, 84% of which are already on granted mining leases. This is the first time one company has held such a large consolidated group of tenements over the field in recent history. Five kilometres of continuous strike: The historic mines in the Queen Margaret Project Area display a 5km strike of continuous gold mineralisation. This is one of the longest continuous gold occurrences in Western Australia. 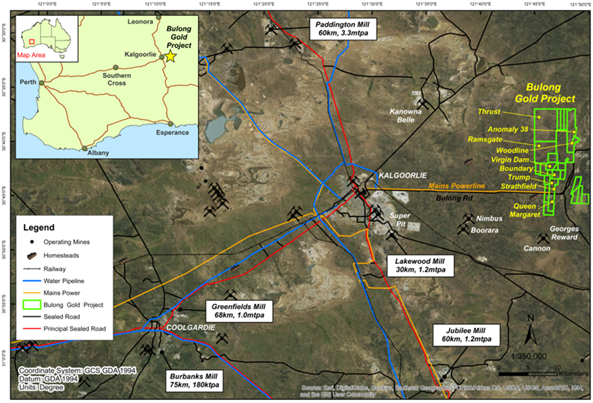 Close to existing infrastructure: The Bulong Gold project is located just 25km east of Kalgoorlie in Western Australia. The main sealed Bulong Road and mains power line, that leads to the mothballed Bulong Nickel Project, passes directly through the property just north of the historic Queen Margaret Mining Centre - one of BC8’s main project areas. Underground and Open Pit potential on granted mining leases: BC8 aim to rapidly progress development by completing infill and extensional drilling on numerous underground and open pitable targets. Numerous drill ready targets are already defined. Previous exploration has been inadequate: Previous companies working at this location did not have the benefit of a contiguous land package. Ownership was fragmented with exploration being undertaken on disparate tenement holdings. This hindered access and prevented proper follow-up of encouraging drill results. Most drilling is shallow: Much of the previous drilling on the tenements comprising the Queen Margaret Project Area, largely performed by AngloGold in the early 2000’s, was targeted towards open pitable mineralisation. The average depth of drilling at the Queen Margaret Project is only 39m. Minimal drilling has been performed below a depth of 50m. BC8 aim to undertake deeper drilling to define mineralisation suitable for underground mining in addition to working up the open pitable target areas.